I keep bumping into beautiful, intelligent women who, for some bizarre reason, allow their husband or boyfriend to treat them horribly. One gorgeous young woman had her boyfriend spit in her face and she still stayed with him! What’s up with that? Do women no longer have any dignity and self-respect? A wife’s dignity is actually a quality that is highly valued in the Bible. 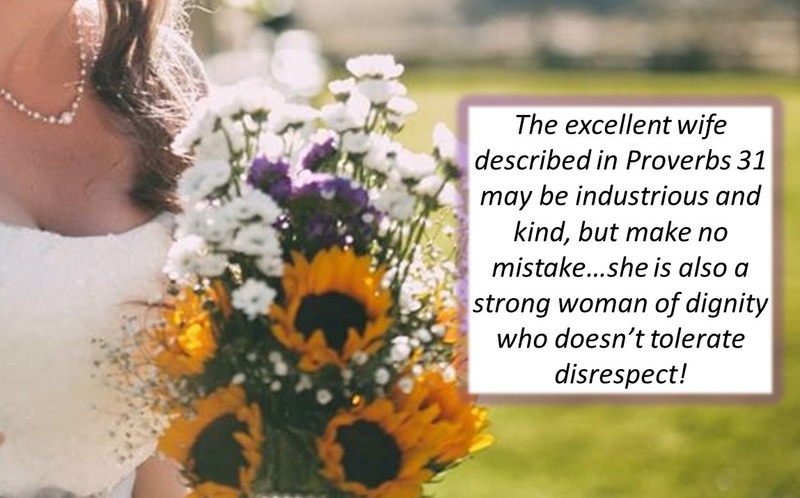 When describing the wife of “noble character” in Proverbs 31, the Bible says in verse 25 “she is clothed with strength and dignity“. So, what does the word “dignity” really mean? The dictionary defines dignity as displaying poise and self-respect. In other words, a woman of dignity respects herself enough to refuse to be treated disrespectfully! Don’t believe the lies of the enemy. Don’t believe that you need to tolerate disrespectful treatment, verbal abuse, or emotional abuse by your man. That’s a lie! A dignified woman doesn’t tolerate that. She confidently, but lovingly, puts boundaries in place and refuses to allow herself to be treated in a dishonoring manner. A confident woman of dignity trusts God to take care of her even if she has to take drastic steps to protect herself such as breaking up with a disrespectful boyfriend or separating from a verbally-abusive husband. Be courageous. Choose to carry yourself with dignity and self-respect.